Some enthusiasts of 19th-century American psychological horror master (or, in a very real sense, 19th-century American psychological horror inventor) Edgar Allan Poe find his work best read aloud. Thus we've previously featured Poe delivered in the gravitas-filled voices of such noted thespians as Vincent Price, Basil Rathbone, Christopher Walken, Christopher Lee, and James Mason. Mason did the reading (above) as a narration for a 1953 animated short The Tell-Tale Heart, adapting Poe's 1843 story of the same name, which drew both an Academy Award nomination for Best Animated Short Film and — perhaps more in line with the Poe sensibility — a rating of "X" from the British Board of Film Censors. 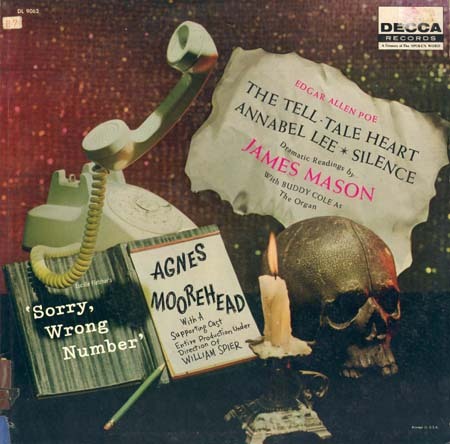 Opinions on who reads Poe most effectively will differ from listener to listener, but if you'd like to make a partial but direct comparison for yourself, simply line up Mason's rendition of "The Tell-Tale Heart" on a playlist with the ones we've previously posted by Christopher Lee, Basil Rathbone — and of course, Iggy Pop. It may have become Poe's best-known story in the first place by having retained its impact over all these 172 years, but having such a range of performative personalities interpret it can't hurt in keeping it as eerie as ever. … vous allez faire grand plaisir à tous les ‘enthusiasts’, that’s for sure. Thank you ! Do not care at all for this “re-telling,” of the story. The revisions lessen the effect of the story, for no purpose. Really, just awful. Mason is masterful of course. Best to find his full version of the story.